The race for the conquest of Mars is no longer just a tempting idea illustrated in science fiction novels. It has become reality. Recently, the European Space Agency sent the lander Schiaparelli to the red planet, a mission which ended worse than expected with the crash of the lander on the martian soil. Even if the Schiaparelli mission didn’t end as well as expected, these last years have shown a great step forward for the exploration of Mars. And China does not want to miss this great opportunity. China is already planning to launch a rover to Mars by 2020. The Agency Xinhua has stated that the rover has been designed for exploring the martian surface for at least three months, powered by four solar panels and including a remote sensing camera and a ground-penetrating radar. The country is also projected to have its own permanent spacial station by 2022. No one doubts that China will respect this program. The country has already achieved important milestones in the space exploration. In 2003 China launched its first mission into space, becoming the third country in history to do so after United States and Russia. In 2013 it has landed its first rover, Yutu, on the moon surface. Now, two Chinese astronauts, or taikonauts, are aboard on an experimental space station named Tiangong, the “Heavenly Palace” – a name that echoes the Temple of Heaven in Beijing. This world’s second largest economy had invested 6 million in its space programs in 2013. According to OECD, this amount is far away from the US budget ($39 million), but it is interesting to point out that Russia, the second country involved in the space race, has invested “just” 5 million dollars. So, as Chinese development has slowed down, China has understood that it cannot base its economy entirely on exports and commodities: in the last years, the country has invested largely on technologies, foreign investments and everything that could strengthen its status of a superpower. President Xi Jinping has claimed his intention to improve Chinese space power and this ambition scares the United States. 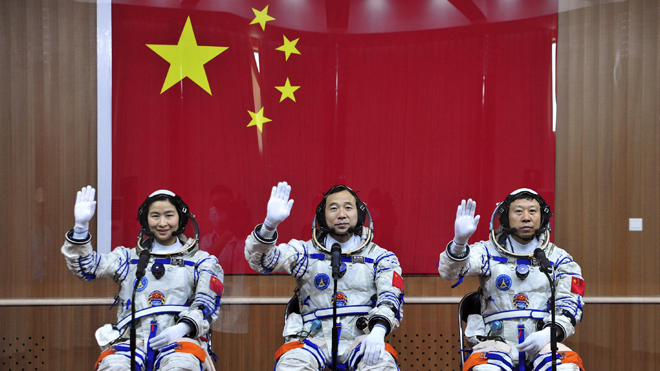 China has always underlined the peaceful purpose beneath its space missions, but it is undeniable the level of geopolitical power that China could gain from its space industry development. Apart from the space tests, Beijing has also tested anti satellite missiles. For this reason the former Obama presidency has banned NASA from cooperating with the Chinese Xinhua. Nowadays, President Donald Trump has showed little sympathy for the Chinese government. This might be a sign that the cooperation among the two superpowers could be further away than ever. But is this lack of cooperation a smart move? Now, around 30 taikonauts are involved in the mission on the Chinese Tiangong, but China is probably destined to continue its space race alone.